Christmas Traditions – Not sure what to get the new neighbors? This holiday gift has all of the tools and ingredients you need to make Christmas cookies! It’s the perfect way to say welcome while spreading holiday cheer. Christmas Star – Have a friend or a family member that you don’t see often, but want to send a gift their way? This holiday gift is a way to send them a full meal in a reusable decoration. This gift includes all of the things for a delicious spaghetti dinner along with dessert! Italian Charm Holiday Gift – What about the babysitter, dog walker, or house sitter who diligently helps you out? This non-traditional gift has their next meal and the kitchen tools to go with it! This gift contains the fixings for a hearty pasta dinner that’s held together by a cute and festive oven mitt. Holiday gift baskets are a great gift option for a number of people, including those that you have trouble shopping for. 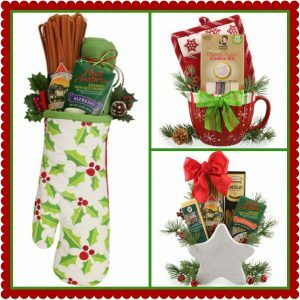 Shop BisketBaskets.com today for everyone on your list and be done before the Christmas rush!